If you've played Far Cry 4 you've seen the ghostly orange tiger and smoky blue elephant leap at each other before exploding into the game's logo. This image of elephant vs. tiger is no doubt meant symbolically, to represent the two paths of skills available, the clash between durability and ferocity, the top and bottom buns of Ajay Ghale's murderburger, as it were, though this idea sort of falls apart because you'll probably unlock everything from both skillsets long before you finish the game. The king of complex smoke-ring that only Gandalf could manage. As I was absentmindedly setting honey badgers on fire in Far Cry 4 recently, I realized I've never actually seen an elephant and tiger fight each other in the game. I've seen a lot of other things fight a lot of other other things. I've seen a tiger wrestling a bear, I've seen a leopard fight a wolf, I've seen an eagle attack a goat, I've seen an eagle attack a pig, I've seen an eagle attack a person, I've seen an eagle attack another person, I've seen an eagle attack every single person in the game, I've seen myself set honey badgers on fire... but I've never seen an elephant fighting a tiger. I decided to see if it's an actual thing that can happen. I snag an elephant from outside Varshakt and hurriedly stampede it to the nearby tiger hunting ground, not stopping to accept a radiant hostage mission or to protect someone from being attacked by an eagle or even to avoid trampling a roving trader. I quickly spot a tiger and drive my 'phant over. While sitting on the elephant, the tiger refuses to fight, making him instantly smarter than 100% of Pagan Min's soldiers. Afraid of a guy with a grenade launcher on an elephant? Coward. I climb off and try to goad the elephant and tiger into a brawl. The tiger is quite interested in attacking me, but when I try to get the elephant in between us, the tiger runs off and kills a tapir or an innocent human being instead. Frustrating! What's more, the elephant keep wandering away or going for a swim in the nearby inlet. Granted, swimming elephants are very cute, but I clearly I need a more controlled environment for to get this rumble humming. To the map editor! 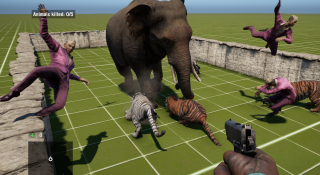 Time to add "Professional Level Design" to the C.V.
Spawning a tiger and elephant on the dreamatorium-like grid results in much the same situation as in the game: they avoid each other and maybe the tiger tries to eat my face. An arena must be built! Here, they'll have no way to escape each other, and I can stand on a wall and watch like some kind of horrid and abusive animal fight promoter. Unfortunately, when activated, the tiger simply coils and growls, and the elephant stands impassively. Adding a second tiger doubles both the growling and the fighting, but since there's zero fighting, and doubling zero is still zero, there is still zero fighting. This is where a smarter man would quit or think up a new topic or do a gallery piece on PC Gaming's Ten Deadliest Animals Of All Time, which someone will probably actually make me do now that I've mentioned it. Unfortunately, I am not a smarter man. Plus I spent, like, three whole minutes building my arena. I am not going to give up so easily or wisely. I throw in more tigers. There's more harmless growling, even when the elephant strolls calmly through them. Bump into someone on a city bus and you'll wind up with a better fight than this. Maybe they need some bait? I throw a steak in, but it's ignored. Maybe they need some live bait? I throw in Pagan Min himself, whose tacky suit should serve to enrage even the most passive of creatures. The elephant quickly kills Pagan while the tigers continue to growl. I remove the elephant, just to see if the tigers are broken or something. The tigers quickly kill Pagan Min, then fight each other, then eventually kill a couple monkeys I also added. Killing each other or celebrating a touchdown? You be the judge. Tigers won't attack a rhino, but a rhino will attack Pagan Min. Tigers will fight with a bear once the bear has killed Pagan Min. A yak will attack and kill Pagan Min. Then tigers will kill the yak and then each other. I will occasionally kill Pagan Min myself just because. Fraps does not recognize the map editor as a game and so all of this has to be done twice. This failure of Fraps makes me as angry as an eagle. Still, no joy on the elephant vs. tiger front. Put an elephant anywhere near a tiger and the tiger just crouches and hisses uselessly, like my own cat when someone slams a car door anywhere on my street. I lengthen the arena to give everyone a little more room, so now tigers will immediately attack each other instead of simply growling, but they still won't attack the distant elephant. I add more Pagan Mins because I like the way he dies, especially when there are many of him dying at once and his dying takes the form of him flying through the air. This is payback for constantly calling my phone while I'm driving. Finally, I simply fill the arena with every land-based animal on the list and a bunch of Pagan Mins, including one standing on the elephant's back. I recorded it, for you and for science. In the (very noisy) video below, Pagan Min meets a terrible fate a number of times, the rhino somehow escapes, the eagle shockingly decides to attack nothing for the first time in eagle history, and the turtle wants none of it. The tiger, as usual, simply growls. At about 1:10, however, the magic finally happens. Okay, yes, the tiger was probably leaping at something else, and the elephant was facing in the complete opposite direction. I'm calling it a win anyway.